Many have Souvenirs from Egypt, where there are inscriptions in hieroglyphics. Of course, I want to understand what is written there. The right thing was to ask the seller. But what if the idea is to decode the message came much later? Choose the charactersthat interest you in the first place. Only in the Egyptian inscriptions was allocated 166 different characters. Some of them are not letters, and ideographs, that is, symbols of certain concepts. For example, in a contemporary letter, this role performs a number can be written and how the word "number". Compare selected characters with the table of correspondence to the Latin letters. It was first made by Jean-françois Champollion, French scholar, who has the honor of deciphering the ancient Egyptian inscriptions. Write found letter - get the sound of the written word. If the characters were encrypted some modern concept, you can easily translate with English as the most widespread in the tourism language. If we are talking about a real ancient inscriptions, you will have to make additional efforts. Examine the same table, ideograms and chords. 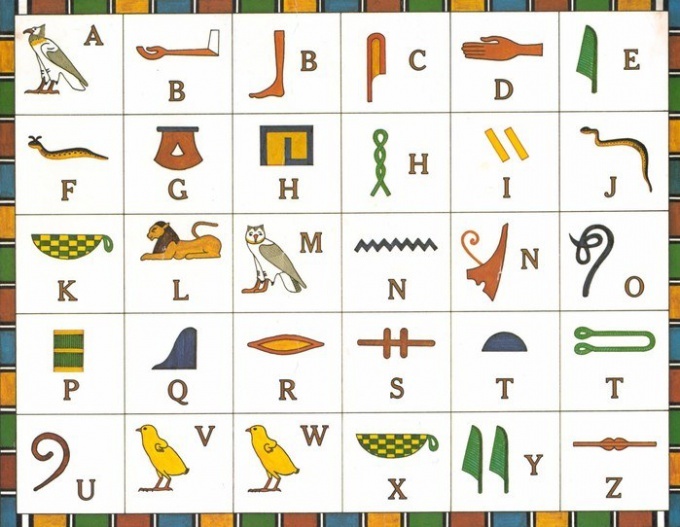 In the Egyptian language various signs were mixed together with letters, in addition, not used for vowels. Compare the translated words from the content of the Coptic dictionary. The fact that knowledge of the language of the Copts still living in Egypt, allowed Champollion to understand and translate the hieroglyphs. Certainly this exercise will help you. Will only pick up a match English words in the Russian language. Learn English speaking part of the Internet: search, for example, in the following words "The Egyptian hieroglyphs to decipher". In contrast to the Russian-language queries, this approach gives a much larger number of really useful links. Can you advise the so-called virtual tour of Egypt: http://www.virtual-egypt.com/newhtml/hieroglyphics/. Here is a detailed story about the kanji. In addition, there exists the possibility to solve the inverse problem: translate your name into Egyptian hieroglyphs.